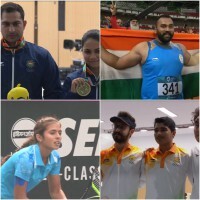 It was a GLORY-FILLED outing for Indian athletes at the 18th edition of Asian Games, where some of the most unknown sports fetched India some unexpected medals. This was India’s best ever effort at the Asaid with 69 medals, surpassing their last best of 65 medals which they achieved at Guangzhou 2010. Here are all the Indian medal winners at Asian Games 2018. 1- Apurvi Chandela and Ravi Kumar won bronze in mixed rifle shooting event. 2- Bajrang Punia won gold in men’s 65kg freestyle wrestling. 3- Lakshay won silver in men’s trap. 4- Deepak Kumar won silver in men’s 10m air rifle shooting event. 5- Vinesh Phogat won gold in women’s 50kg freestyle category. 6- Sanjeev Rajput won silver in men’s 50m rifle 3 positions shooting event. 7- 16-year-old Saurabh Chowdhary won gold in men’s 10m air pistol shooting event. 8- 29-year-old Abhishek Verma won bronze in men’s 10m air pistol shooting event. 9- India won maiden Sepak Takraw bronze at Asian games. 10- Divya Kakran won bronze in women’s 68kg freestyle wrestling. 11- Rahi Sarnobat won gold in women’s 25m air pistol event and became the first Indian women’s shooter to win gold at Asian Games. 12- Narender Grewal won bronze in men’s Sanda. 13- Surya Bhanu Pratap won bronze in men’s Sanda. 14- Roshibina Devi won bronze in women’s Sanda. 15- Santosh Kumar won bronze in men’s Sanda. 16- Indian men’s kabaddi team won bronze after a shocking loss to Iran in semi-final. 17- Rohit Kumar and Bhagwan Singh won bronze in lightweight double sculls. 18- 15-year-old Shardul Vihan won silver in men’s double trap shooting. 19- Dushyant won men’s lightweight single sculls. 20- Ankita Raina won bronze in women’s singles tennis event. 21- Indian women’s kabaddi team settles for silver medal. 22- Heena Sidhu wins bronze in 10m air pistol. 23- Rohan Bopanna/Divij Sharan won gold in men’s doubles tennis event. 24- Indian rowers won QUADRUPLE sculls gold. 25- Prajnesh Gunneswaran won bronze in men’s singles tennis event. 26- Tajinderpal Singh Toor won gold in men’s shot put with Asian record. 27- Yahiya Muhammed Anas won silver in men’s 400m. 28- Dipika Pallikal won bronze in women’s singles squash event. 29- Joshna Chinappa won bronze in women’s singles squash event. 30- Saurav Ghoshal won bronze in men’s singles squash event. 31- Hima Das won silver in women’s 400m with a national record. 32- Dutee Chand won silver in women’s 100m. 33- India won silver in Equestrian team event. 34- Fouaad Mirza won silver in equestrian. 35- Indian mixed bridge team won bronze after losing to Thailand in semi-final. 36- Indian men’s bridge team won bronze after losing to Singapore in semi-final. 37- Saina Nehwal won bronze in women’s singles badminton event after loosing to Tai Tzu Ying. 38– Dharun Ayyasamy won silver in men’s 400m hurdles. 39- Sudha Singh won silver in women’s 3000m steeplechase. 40- Neena Varakil won silver in women’s long jump. 41- Neeraj Chopra won gold in men’s javelin throw. 42- Team of Jyoti Surekha, Madhumita Kumari and Muskan Kirar won silver in women’s compound team archery event after loosing to South Korea. 43- PV Sindhu won silver in women’s singles badminton event after loosing to Tai Tzu Ying of Chinese Taipie. 44- Indian men’s table tennis team won bronze. 60- Varun Thakkar Ashok and Chengappa Ganapathy Kelapanda won bronze in the 49er men’s Sailing event. 62- Vikas Krishan won bronze in men’s 75kg boxing after pulling out from the finals due to eye injury.